In 1999 I had received information that the first two verses I’ve listed below may be attributed to Rukard Hurd. Hurd was a member of the Class of 1878 of the Pennsylvania Military College, which later became Widener University, and a trustee from 1895 to 1922. He is said to have composed the lyrics to Taps now used by most every Boy and Girl Scout troop in America. The University regularly gives permission for their use to Scout troops and other groups, as the rights to the copyrighted lyrics were willed to P.M.C. and then Widener by Mr. Hurd and his descendants. Indeed, many early citations of the lyrics to Taps cite the Pennsylvania Military College or Mr. Hurd as author. The University is in the process of producing a photocopy of a dated publication or dated and signed manuscript, which would predate any other extant publications for these same lyrics of Taps. It may be that Hurd is the original author, or that he borrowed someone’s lyrics. 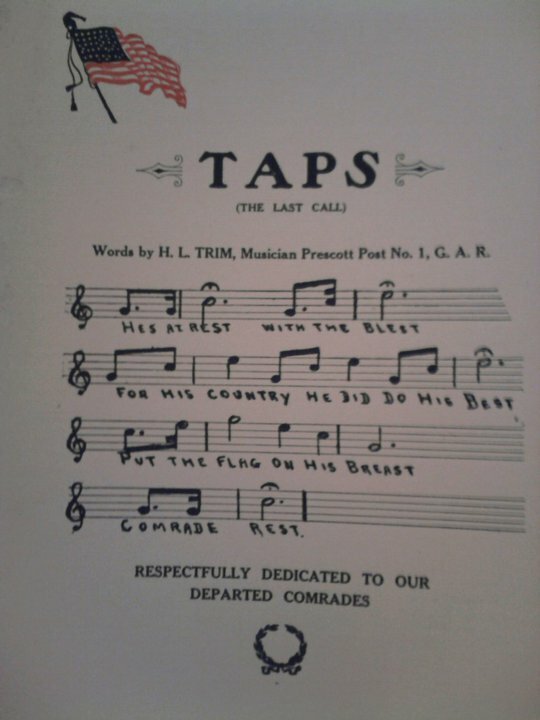 Until the original documents by Rukard Hurd, wherein he donates or sells the copyrights to these lyrics for Taps, can be found, we have to list the author as “unknown.” The words have also been attributed to Forrest W. Gaz, who worked for the Civilian Conservation Corps during the 1930s. Gaz is listed as author in The Soil Soldiers–Civilian Conservation Corps in the Great Depression by Leslie Alexander Lacy. Whoever the true author may be, these lyrics are very moving and poignant. There are no official words to the music, but below are some of the more popular verses. Here is another setting of Taps. Elegy, by Daniel Elder incorporates the famous melody, along with the original poetry and new music by Elder. This entry was posted on Friday, April 7th, 2017 at 12:06 am	and is filed under Bugle Stories, Buglers Through History, General Interest, History of Taps, History of the Bugle. You can follow any responses to this entry through the RSS 2.0 feed. Responses are currently closed, but you can trackback from your own site.